The House passed its “Tax Cuts and Jobs Act” November 16th and the Senate passed its version December 2nd. Both bills would raise taxes on many low- and middle-income families in every state and provide the wealthiest Americans and foreign investors substantial tax cuts, while adding more than $1.4 trillion to the deficit over ten years. In the coming days, the House and Senate will attempt to resolve the differences between the tax bills passed by each chamber to produce a final bill that congressional Republicans hope to send to President Trump before the end of the year. Both bills would make major changes to the personal income tax, the corporate income tax, and the estate tax, and both would provide a disproportionate share of benefits to the richest taxpayers while raising taxes on millions of others. Despite differences, under both bills the richest 5 percent of Americans would receive about half of the benefits in 2019. The richest 1 percent would receive more than a quarter of the benefits under the Senate bill and more than a third of the benefits under the House bill. In later years, the effects of the two bills would differ because all the personal income tax cuts would expire under the Senate bill while the corporate cuts are made permanent. For many taxpayers, the only provisions still in effect would raise their taxes. Further, the bottom three-fifths of households would pay higher taxes on average in 2027 while higher-income earners would still pay less on average. But that does not mean the House bill is good for low- and middle-income people in later years. By 2027, the richest 1 percent of taxpayers would receive nearly half of the benefits in the House bill. While the average taxpayer in each income group would continue to receive tax cuts under the House plan, many individual taxpayers would face tax hikes, and the average tax cuts for low- and middle-income groups would shrink significantly. By 2027, the House bill would raise taxes on more than a fifth of taxpayers while the Senate bill would raise taxes on more than a quarter of households. Within the middle-fifth of taxpayers, the literal middle-class, a fourth would pay higher taxes under the House bill and a third would pay higher taxes under the Senate bill. As explained in more detail below, these estimates take into account the possibility that individuals could benefit from corporate tax cuts and estate tax cuts. For the Senate bill, these estimates also take into account the tax changes that would result from the repeal of the mandate to obtain health insurance (which is in the House bill but not the Senate bill). In others words, even if one believes that corporate tax cuts provide some benefits to typical taxpayers (a notion that many find doubtful), these estimates demonstrate that many low- and middle-income Americans would be worse off under these bills. Under both bills, the personal income tax changes affecting families and individuals—the changes most people think of as affecting their lives directly—would raise taxes for some and cut taxes for others. Under both bills, the initial result would be a tax cut for the average taxpayer, but some individuals would pay more. Other changes in the personal income tax would affect “pass-through businesses” (businesses that are taxed only under the personal income tax instead of the corporate income tax.) Pass-through businesses are sometimes portrayed as small businesses, but they include law firms, hedge funds and companies such as Bechtel, a large, privately owned company. Most pass-through income goes to the richest 1 percent of Americans. Under the Senate bill, personal income tax cuts for families and individuals and those for pass-throughs would expire after 2025. After that, the only change still in effect that touches families and individuals would be a slower inflation adjustment (often called the chained consumer price index) which would gradually push families into higher tax brackets and make many deductions and credits less generous over time. For pass-through businesses, the changes remaining in effect after 2025 would be a handful of provisions that raise their taxes. Under the House bill, some provisions would expire after 2022, but the vast majority would be permanent, so the changes for families and individuals and the changes for pass-through businesses would still provide the average taxpayer within each group a tax cut. But there would nonetheless be some taxpayers in each group who receive a tax hike in part due to chained CPI. While some details differ, both bills would dramatically slash the official corporate income tax rate from 35 percent to 20 percent. While the official corporate rate today is 35 percent, most American corporations pay far less than 35 percent of their profits in federal corporate income taxes. Lawmakers have talked for years about eliminating special breaks and loopholes for corporations and using that revenue to offset a reduction in the corporate tax rate. But the House and Senate bills fail to close anywhere near enough loopholes to pay for their massive corporate tax rate reduction. Economists generally agree that the benefits of corporate tax cuts initially go to those who own stocks in American corporations. While some middle-income Americans do own stocks, most is owned by upper-income taxpayers and foreign investors. Recent research has concluded that foreign investors own 35 percent of stocks in American corporations and would therefore receive a significant share of the benefits from corporate tax cuts. Many economists believe that by the end of the decade some of the benefits of a corporate tax cut would go to workers in the form of higher wages. It is unclear when or if this would ever happen. But ITEP follows the approach of Congress’s official revenue estimator in assuming that, by 2027, one-fourth of the benefits of the corporate tax cut would go to workers, which would mean the benefits are a little less concentrated on the rich. But even this assumption does not change the fact that the corporate tax cuts provide the richest taxpayers with the greatest benefits. The estimates in this report combine the effects of corporate tax changes and the other tax changes under both bills. The portion of the corporate tax cuts flowing to foreign investors would be similar or larger than the total tax cuts going to the bottom three-fifths of Americans. By the end of the decade, foreign investors would continue to receive more benefits than the bottom 60 percent of Americans combined under the House bill. Under the Senate bill, by the end of the decade foreign investors would continue to receive benefits while the bottom 60 percent of Americans would pay more overall. Unlike the House bill, the Senate bill would repeal the existing requirement for individuals to obtain health insurance. The figures in this report incorporate the estimates of the Congressional Budget Office on how this change would affect revenue. Some revenue would be lost because the penalty for not having health insurance would be eliminated. But overall repeal of the health insurance mandate would raise revenue because many of the people who would go without coverage are people who receive tax credits to pay premiums under the Affordable Care Act. The reduction in tax credits paid out would result in overall revenue savings. To learn more about how ITEP models these tax proposals, see the methodology section of ITEP’s report on the previous version of the Senate tax plan. 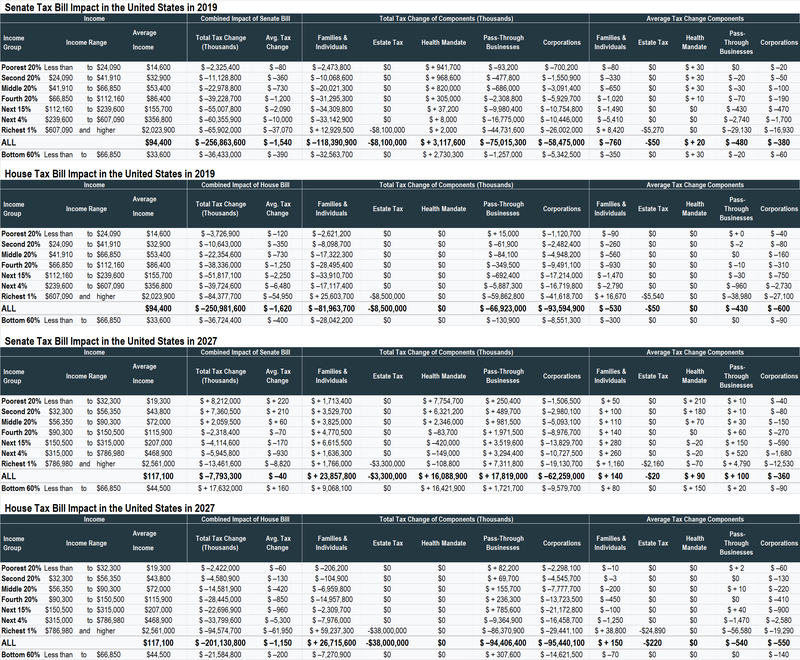 Click here to download the national and 50-state data showing the impact of the House and Senate tax bills in 2019 and 2027.